October 25, 2018~ Having worked with many folks in the Senior Services industry, I was familiar with Retirement Connection , THE gold standard resource guide. That’s one of the reasons I was FLATTERED when owner Amy Schmidt asked me to write an article about photo organizing for the October 2018 issue: “Creating a Lasting Legacy”. Retirement Connection is truly an “at your service resource directory” chockablock with invaluable information. If you are looking for a answers at your fingertips, you’ll want to have a copy for your very own. 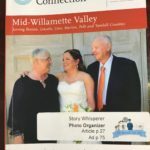 Look for my sponsor ad on Page 75 and my article “Creating a Lasting Legacy” on Page 27 of the October 2018 Mid-Willamette Valley issue! At age six, Zoe rode her first two-wheeler into the world, discovering the stories, photos and secret hearts of her neighbors. She’s finally gone back to her roots, collecting stories, organizing photos, and making new friends on her journey.